Here at Tile Shower DIY, our #1 goal is to help do-it-yourselfers create the showers & bathrooms of their dreams, turning a boring & outdated bathroom into a luxurious spa-like experience. 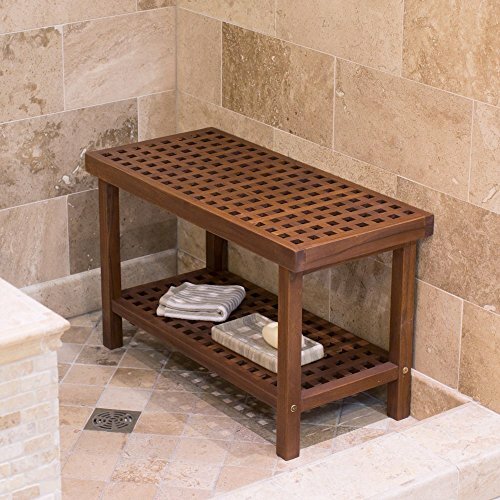 And – whether you’re building a brand new custom tile shower or simply sprucing up the one you’ve already got – a beautiful, elegant, yet simple teak shower bench can be one piece of the puzzle to help you do just that! In this post, I’ll explain everything you need to know about choosing a teak shower bench for your home: the benefits of using teak, our top choices narrowing down the field for you, how to maintain, and more, so you can make a quick & easy decision in buying a teak shower bench for yourself. A shower bench, in general, regardless what it’s made of, can be a great addition to anyone’s shower. But it can be especially beneficial for the elderly, disabled, or others with physical limitations, providing a comfortable place to sit while showering & bathing. A shower bench can even offer an aid in the process of shaving. Why Teak Wood For a Shower Bench? It’s very dense and resists warping and twisting with exposure to water. Natural oils in the wood protect it from being damaged by repeated exposure to moisture. Teak doesn’t easily splinter, crack, or chip. High silica content in teak wood gives it a natural anti-slip quality. It’s very durable, especially in a shower where the environment is constantly wet & humid. Teak is naturally mold & mildew resistant. Where metal rusts, and plastic breaks down & gets brittle over time, a teak shower bench will give you years of comfort, convenience, and beauty! 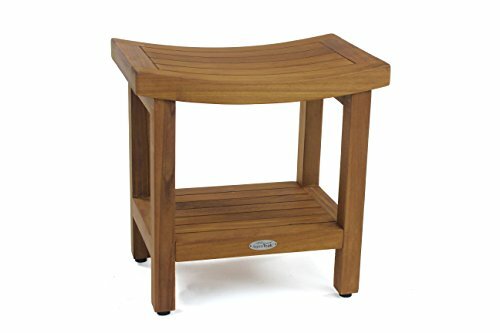 Can Teak Shower Benches Get Wet? Widely used on boats and outdoor furniture, teak is one of the best woods to use in places that have repeated exposure to water. Natural oils present in the wood help it repel water. Most teak shower benches are also made with spaces between the seat boards, allowing for water to run off quickly. How Well Do Teak Shower Benches Hold Up? While the wood holds up extremely well to water, and resists mold & mildew, it does age just like any other wood, turning a dull gray color over time. While some may like the aged & weathered look, many prefer the rich, deep, honey-like colors teak has when it’s new. Further on in this article, I’ll give some tips to maintaining your teak shower bench to keep it looking good as new. Can stain easily as well. Bath products with colors are most likely to stain teak; including things like shampoos, soaps, gels, and bath salts. You can find teak shower benches in a variety of shapes & styles. Benches as wide as three feet can be used in large showers and compact corner benches can be used in showers with less space. Many have a curved seat for added sitting comfort. Arms and/or Handles – Arms can be great for resting on, using to aid in pushing up as one is standing (elderly, disabled, physically limitations). Handles can make it easier to lift and move the bench if it needs taken out of the shower. Adjustable feet – As you probably know, most shower floors aren’t even or level. If that’s the case for your shower, a bench will probably rock and sit unevenly on the floor. A shower bench with adjustable feet will help you level it up in a jiffy. Back – If you want to relax and lean back against the shower wall, it could be a bit cold, but having a wooden back to your teak shower bench would be warmer to the touch. Shape – Whether you want a long, rectangular bench to sit along a long side of the shower, or a compact triangular bench to fit in the corner of a smaller shower, you’ll be able to find one that fits your situation. Oversized – For larger individuals an oversized bench, with higher weight capacity, would be wise to get, or perhaps you just have a big shower and want a large bench to match properly. 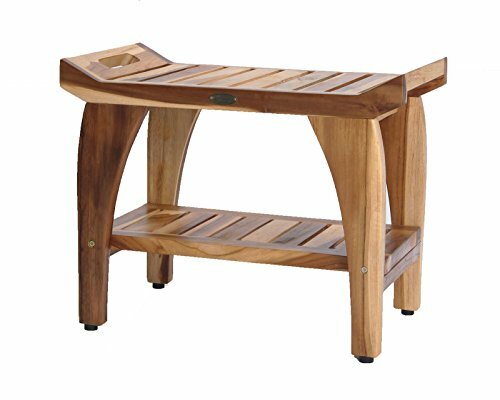 With just a quick search online, you’ll see it can be overwhelming to try to choose the best teak shower bench available. There are so many to sort through, with so many variations, and particulars to pay attention to. So we’ve done that hard work for you, sorting through them all, and have assembled a list of our top choices for teak shower benches. How did we choose our recommended list of teak shower benches below? We look at customer reviews, ratings, prices, features, their pros & cons, and more. Along with having a pulse on what trends & styles are most common in current bathrooms, we then weigh out all the considerations – so YOU don’t have to! – to come up with what we think would be the best choice for the “average person”. While it’s impossible for us to tell you which teak shower bench is THE best for your specific situation, you can get a great head start with our list here, and then modify your selection based on your needs, your shower size, style & layout, etc. With the highest customer ratings of all the benches we considered (4.9 out of 5 stars), this shower bench made from sustainably harvested 100% solid Teak wood, gets our top spot for best overall. It’s well built, and comes with a 5 year manufacturer’s warranty, so you know they believe in and stand behind the quality of it. The bench has all stainless steel hardware, which will not corrode, and has adjustable rubber feet to level the bench and keep it stable. Its superior design has gotten it featured in Architectural Digest magazine, and customers leaving reviews have said they really like the look it gives their showers. The slightly concave curved seat adds comfort, and at 18″ High x 18″ Wide x 12″ Deep, it will fit perfectly in the average sized shower. The storage shelf below the seat gives an added place to keep shampoos and other shower products. Some assembly is required with this model. Folding, wall mounted benches are great for showers with limited space; fold them down to use and simply lift up and against the wall to have all that space back when not in use. This one from Moen has a 4.8 out of 5 star Amazon rating, giving it this top spot in our list! If a wall-mounted, folding shower bench is the way you want to go for you shower, in browsing models available online, pay careful attention to the weight limit rating for each one. Many are limited to holding 220 or 250 pounds (highly dependent, not only on the construction of the bench itself, but on how securely the manufacturers recommend mounting to the wall). This one from Moen – a highly trusted brand in bathroom and plumbing products – will support up to 400 pounds, so it’s also great as an oversized shower bench for larger individuals. The design, natural tones of the teak wood, and bronze colored aluminum frame all help make this piece a great compliment to many styles, whether traditional or contemporary. Customer reviews state that it’s beautifully crafted, sturdy, well-built, and gives their showers a feeling of luxury. If you have a larger shower with more space, this 36″ wide Aqua Teak shower bench could be just the fit. 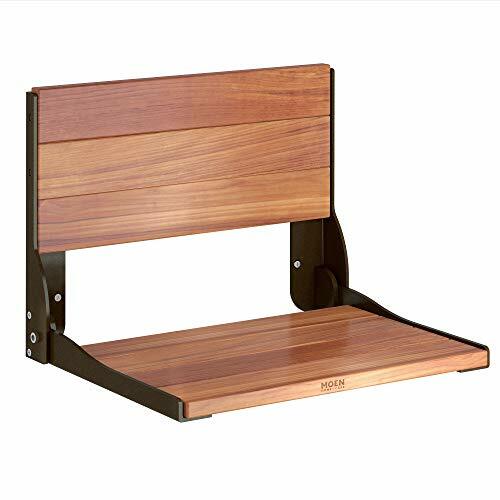 Like other Aqua Teak benches, it is made from sustainably harvested solid teak wood, all stainless steel non-corroding hardware, and has adjustable rubber feet for stability. Getting 4.9 out of 5 stars on Amazon, it has garnered an amazing reputation from customers. Many reviewers say it’s a beautiful piece, well-built & sturdy, with quality workmanship, that they feel was well worth the money. It requires assembly, but customer reviews stated that it’s quick, taking only about 10 minutes for one person, and the instructions were clear & concise. Small and compact, more of a foot stool than an actual bench, but would serve the purpose well for a small shower. It has adjustable rubber feet to help keep it stable & level, has a lower storage shelf, and has a 4.5 out of 5 star rating on Amazon. Reviewers have commented that it’s well built, good for resting a foot on, and for lighter individuals to sit on, but not a full sized shower bench – which is expected for its compact design that allows it to fit in small showes. A really nice benefit to buying this model is that no assembly is required. This model caught our eye and made our list because of its unique design. After looking and sorting through all the shower benches available online, you start to see the same few patterns/styles over and over…but this one is unique. And for that, along with its 4.6 out of 5 star Amazon rating, we have it in our Top 5 with the best unique design. Like other EcoDecors models, it is 100% teak wood, has rubber adjustable feet, and non-corroding hardware. Many customer reviews show a great percentage of buyers absolutely love the look, feel, and quality of this piece in their shower. This is a shower bench that we just couldn’t leave out, simply because of its unique design. 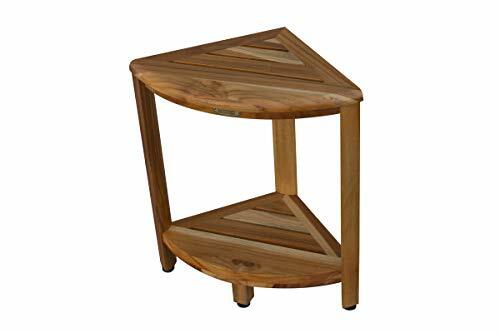 Much like the Eastern Style shower bench at #5, this teak shower bench by Belham Living deserves a top spot because of its lattice design element…and having a 4.6 out of 5 star rating on Amazon sure doesn’t hurt either! It’s 30 inches wide, so fits both medium and large sized showers. Customers have stated that it’s easy to assemble and has well-written instructions. With its durability, and mold & mildew resistance, teak needs very little maintenance. But, a little routine maintenance will keep your teak shower bench looking like new for years to come. After showering, rinse off the bench to make sure it’s free of soaps, shampoos, and other products. And, every month or so, or as needed, scrub the teak wood with a soft-bristled brush and water to remove build up of residues from soaps or small amounts of mildew. You could use a mild soap & water solution as well. Then rinse and let it dry. Pro Tip: Performing a regular, quick cleaning using only water and a soft scrub brush will help prevent stains and discoloration. While cleaning your bench is definitely a good thing, the process of cleaning the wood also strips away the naturally present oils in the wood that help it keep its rich color. Without the oils, the wood will oxidize to that dull, silver-gray weathered color. 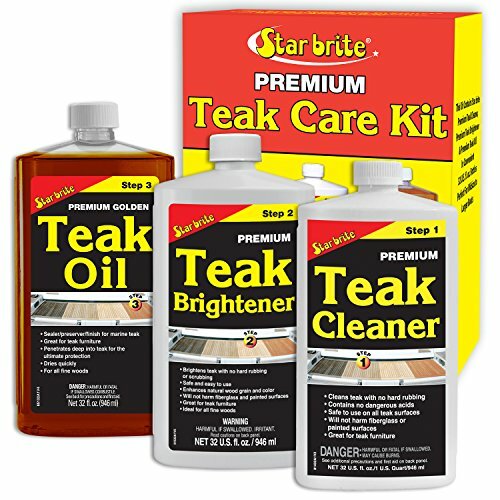 So, every few months, you’ll want to apply Teak Oil to the wood to keep it looking new & rich! 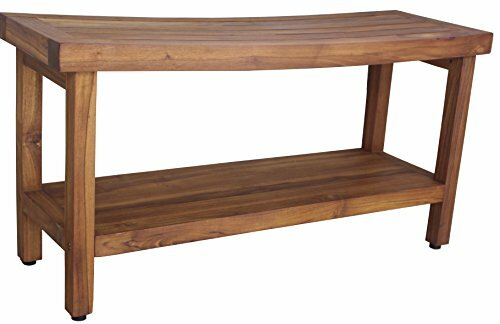 Has your teak wood bench already turned quite grey and dull? It’s not beyond hope. With a little elbow grease, you can have it looking good as new. Sand lightly with 80 grit sandpaper, then work up to finer grits like 120 and 220. Once it’s sanded, remove dust by wiping with a dry cloth or blowing off with pressurized air, and then apply a teak oil to seal it.